Most people are familiar with how the location features of "Where's My iPhone" and "Find My Android" work. 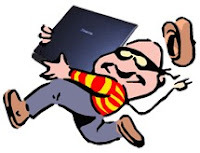 The key is to ensure a tracking system is installed BEFORE the laptop is lost or stolen. The same tip is true for smart phones. It's too late after the device is missing. There are a number of free and premium services available to track and lock a laptop. Our two recommendations are Prey and LoJack. Prey offers a free solution with a limit of 3 devices per account and 10 reports. It is a good basic service that will work for most people. In addition, Prey can also be installed on other devices such as iPhones and Android. Premium personal plans that offer more devices and reports start at $5 per month. Devices can be locked to prevent access and an alarm can be sounded. Prey offers a basic service that no laptop should go without. LoJack is well known for its vehicle tracking systems. Many car thieves have learned the hard way when a car is protect with LoJack and it is disabled with police waiting to arrest them. LoJack have licensed the name to Absolute for the laptop tracking. While there is no free service like Prey, LoJack offers a 30 day free trial. Premium plans begin at $39.99 a year for laptops, $29.99 a year for phones and $29.99 for tablets. LoJack can track a device and lock it including erasing the data. LoJack advertises that even if the device is reset to factory defaults, the LoJack software will remain to enable locking, erasing and tracking. LoJack also advertises a guarantee (like everything, read the fine print). Whether you use Prey or LoJack, don't wait until disaster strikes. Like up-to-date PC anti-virus protection and regular data backups, prevention is the best medicine. Install a theft recovery before it's too late.